A ROUSING finale of “Kay Ganda” brought the audience to its feet in a standing ovation befitting the night of Original Pilipino Music (OPM). The top-notch seven-singer group, The Ryan Cayabyab Singers (RCS), were in top form, in spite of the hectic schedule upon their arrival in the U.S. just days prior, and a Las Vegas show the day before landing in Los Angeles. In a tribute-themed program directed and arranged especially for the RCS, the exemplary vocals of Poppert Bernadas, Katherine Tiuseco, Celine Fabie, Nica Tupas, Erwin Lacsa, VJ Caber and Anthony Castillo were their energetic selves giving top-notch vocal performances. The group performed medleys of songs by Rico Puno, jukebox classics, The Apo Hiking Society, and of course, from Maestro Ryan Cayabyab himself. 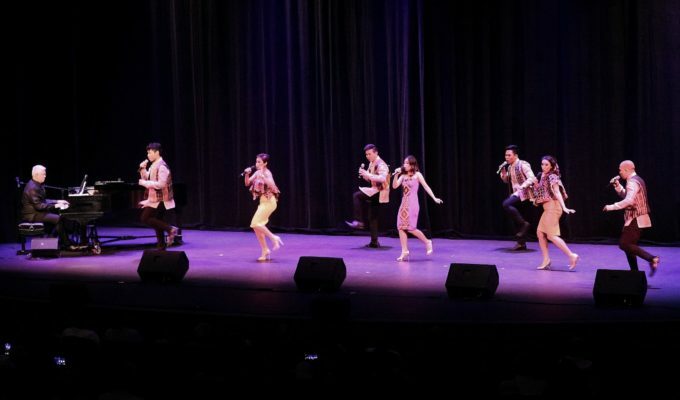 The full house at the John Wayne Performing Arts Center in Glendale, California on Sunday, April 7 enjoyed a great variety of performances from Los  Angeles-based artists who all have had a deep connection working with Cayabyab in his almost five-decade career. 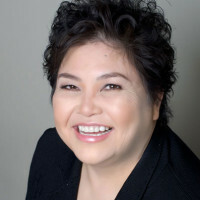 Geneva Cruz, who has blossomed into a strong woman image, performed the songs which made her a teen singing, having been discovered and nurtured by Cayabyab. Her songs “Kailan” and “Mama” brought tears through her heart-wrenching rendition. The audience was treated to the first-ever musical exchange between Cayabyab and legendary songwriter Odette Quesada. Never before had they “traded” songs, with Cayabyab singing “Don’t Know That to Do” and “Til I Met You” while Quesada sang “Kahit Panaginip Lang” and “Tuwing Umuulan” in one the most exciting duets of the evening. Tenor Sal Malaki, one of the longest resident artists of the LA Opera, sang “Anak Dalita”, a selection from the all-kundiman album of Celeste Legaspi, “Koleksiyon”. Malaki’s trademark sustained high-notes at the ending was one of the highly-applauded numbers. Malaki was the lead in the Cayabyab-Asensio opera “Spoliarium,” about the life of Juan Luna. Representing Cayabyab’s stage musicals, were Miguel Vera, who played the lead in Cultural Center of the Philippines’ stagings, and Annie Nepomuceno who performed excerpts from “Rama Hari” and “Noli Me Tangere.” Renowned Jazz vocalist Mon David sang “Mamang Kutsero” first released in Cayabyab’s revolutionary one-man acapella album. Performing a song written for her by Cayabyab, Louie Reyes lit up the stage with her scatting vocals, while proving the versatility of Cayabyab’s songwriting skills and genre fluidity. This was also a quick reminder that Louie Reyes was one of the most active concert artists before moving to the US. The most vibrant number was the dance number “Singkil,” a selection from Cayabyab’s first album of jazzified folksongs “Routes to Roots.” Closing the first half of the show, Kayamanan Ng Lahi in Maguindanao costumes juxtaposed with the young hip-hop group The Riot. Rounding out the show was the stirring vocals of the RCS singing “Paraiso.” As they started ethnic chanting, the RCS was joined by a rush of choral singers, comprised of the Los Angeles Young Ambassadors, The Choristers of LA, the LA cast of Noli Me Tangere and the Inspirare Vocal Ensemble. Conducted by Ed Nepomuceno, a rousing “Kay Ganda Ng Ating Musika” closed the show. But before closing the curtain, the cast sang “Happy Birthday” to co-producer Henry Chen, one of the group’s staunchest supporters and music aficionado. Cayabyab and the RCS were literally mobbed post-show, probably from hearts full of Pinoy pride and inspiration after the night of show-stopping sing-and-dance, phenomenal guest performances, and of course, the beauty and breadth of Cayabyab’s musical work. This third U.S. tour comes after Cayabyab was recently conferred the title of National Artist for Music by the President of the Philippines in Malacanang last October 2018. Presented by Music Arts Events and Philippine Patrons of the Arts USA, the concert was co-produced by JIR Foundation, Faith Hope Love Family Music, ANCOP USA, Diva Brava Entertainment, Meycauayan Association of Southern California. Major sponsors were the Asian Journal, TFC The Filipino Channel and Individual Health Care, Get Assured, Cypress Residences, Medin Garcia of Saladmaster, LA Rose Café, Ninong’s Auntie Dees’ Bakery, Toto’s Lechon, House of Grill, Fiesta Fastfood, Island Pacific, Philhouse, and Flowers by Ed Rame. Bankruptcy: Are you living without a financial plan?